What if you could have a time machine to speed up InDesign editorial production, based on the world’s best real-time collaborative editor, Google Docs? What if you could place Google Docs documents with live links in InDesign, and proceed with production, while your authors and editors continued working on the original documents? What if, when they had updates, you could magically merge their work into yours with a click (as a link update), without losing any work on either side, and with automatic notification of any conflicts? What if you could push your content changes back to the original Google Docs documents at any time, staying synchronized with your authors and editors? What if you could export original InDesign content to Google Docs online, allowing collaborators to work on the exported content, and then re-import their changes with a click using the same magic merge? You can do all this, and more, with DocsFlow, your Google Docs-based time machine. DocsFlow, a plug-in for InDesign, for the first time combines the collaborative editing power of Google Docs with the layout power of InDesign, adding its own dynamic linking and sophisticated merge technologies to supercharge your editorial and production workflows. More importantly, DocsFlow maintains a dynamic link so it can intelligently merge Google Docs changes into the InDesign story contents on each link update, rather than just replacing the story. 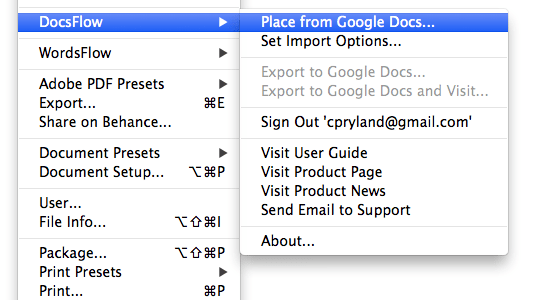 The Pro version provides a two-way link so you can push your InDesign story changes back to Google Docs. So you can format, layout, and edit in InDesign, while your authors and editors continue creating and editing story content together in real time using Google Docs documents, all without ever losing work. Your authors and editors are no longer “frozen out” once layout begins. Using DocsFlow means you need no special resources to build, maintain or learn the editorial side, which is just Google Docs. It means zero cost per editorial seat, which again is just Google Docs. It means no limits to how many people are collaborating online, or to how many documents you use in your workflow. It also means no learning curve on the design side, since DocsFlow builds on the native InDesign story linking and story updating machinery you’re already using for graphics. And getting started couldn’t be easier: just download and install the plugin, and start placing documents with Place from Google Docs. If DocsFlow’s first breakthrough is to make it possible to link to Google Docs directly from InDesign, DocsFlow’s second breakthrough is deep merge technology that enables you to edit both the InDesign story and the Google Docs document independently, without losing work on either side. When the Google Docs document is edited, DocsFlow will notice fairly quickly, and ask InDesign to change the link’s status to “modified,” which shows up in the Links panel (a yellow alert icon, as shown here). When you’re ready, you can update the story from Google Docs using the normal link-update invocations, such as a double-click on the icon. As the link update starts, DocsFlow kicks in. Instead of letting InDesign replace the linked story wholesale, it applies a complex algorithm behind the scenes to merge the changes made to the external document since the last update into the current InDesign story contents (and to detect any conflicts). We call this the “magic merge-update,” since it seems like magic the first times you see it working. It’s this magic that saves you from endless error-prone manual merging. After each update, if you open the story editor with change marks showing, you can see who changed what, and how those changes fit in (or not) with the local story edits. DocsFlow also leaves InDesign notes at each point of conflict to let you know you may need to resolve something. With its dynamic linking and merge-updating, DocsFlow enables powerful new workflows. The Pro version of DocsFlow adds two major features to give you a fully two-way workflow. With DocsFlow Pro, you can push updates from any InDesign story back to its linked Google Docs document. This way, you can keep your collaborators working with the latest InDesign content. And using the same magical 3-way merge technology used for an import merge, DocsFlow merges your InDesign changes into the Google Docs content on update; further, while doing so, it does its best to keep your Google Docs formatting intact, to minimize jarring styling changes. 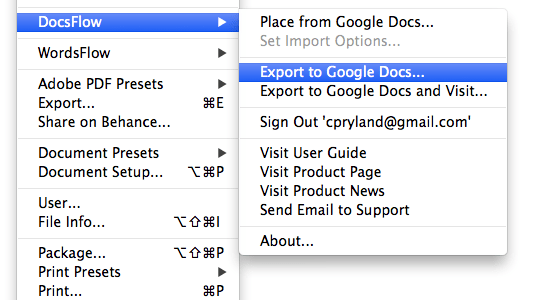 Additionally, the Pro version can export original InDesign story content to create a new Google Docs document. So, for example, you could assign a newly created story to be fleshed out or further edited by exporting it to Google Docs, and from there, sharing it with your authors or editors. As they make additions and changes to the exported document, you can pull them in with a normal DocsFlow story update, usually with just a double-click. The Pro version of DocsFlow also works with Google Docs spreadsheets. You can place a spreadsheet, then format columns/rows or individual cells, etc. in InDesign. Later, if you or someone else makes changes to the original spreadsheet, including moving around rows or columns, DocsFlow will figure out what changed, and merge in the changes without losing the formatting and edits you’ve made in InDesign. DocsFlow Pro doesn’t support two-way workflow with spreadsheets, for now. But we call it a “one and a half-way workflow,” since you can work on both sides simultaneously. If you use the Google Drive file system extension in Mac OS or Windows to access your documents and spreadsheets, you can place any Google Drive file by simply dragging and dropping it from the Finder or Windows Explorer into InDesign. DocsFlow will intercept the drag and drop and treat it like a Place from Google Docs. This gives you the benefit of system folder navigation in your Drive files when placing, if you have a lot of documents or folders (which would otherwise be challenging to navigate or find via the normal DocsFlow place dialog). DocsFlow is one of those plug-ins that can literally be life-changing in how much it improves your workflow, especially when you work with documents written or edited by a number of people. It’s certainly no replacement for the power of Adobe InCopy, but it’s more than enough for many (and perhaps most) InDesign users. DocsFlow is not competing directly with Adobe’s InCopy. The Google Docs user can’t “edit to fit,” seeing the layout-critical formatting, line breaks, overset copy, etc., that the InCopy user sees by design. Rather, DocsFlow works best when the bulk of the editing will be done on the Google Docs side, with minor edits and all page formatting and layout happening on the InDesign side. DocsFlow’s main advantage is that everyone can see and edit the original copy in real time on Google Docs, at no cost per user. And, in most cases, authors are better off writing with a focus on content rather than eventual layout and formatting. That said, we do have plans for future product features that will help with copy-fitting and general layout feedback to the Google Docs user. We strongly encourage you to try out the software in your environment before purchasing, to make sure it will work for you. To jump right in and start your fully-functioning free 15-day trial, see the “Free trial” sidebar. To see how DocsFlow is helping people with their editorial workflow, see our case studies. From the sidebars on this page, you can visit the user guide, testimonials, and product-related news, purchase licenses, download the software, see the release history, find out about using the software as a fully-featured trial, and find more about product support. If a web-based editorial workflow doesn’t make sense for you, our WordsFlow product gives similar acceleration to a Word/Excel-file-based workflow. See Downloads above for a fully-functional trial version that will operate for 15 days (including the Pro features) with no other limits. You can purchase a license at any point, without re-downloading and re-installing. See Quick start immediately below for how to get started. Also see general evaluation information. When the linked document is edited, double-click the link-changed icon in the Links panel to update. Sit back and enjoy the "magic merge-update" functionality of DocsFlow. For full information, see "Getting started" in the user guide. If you're having problems, you should first check the Google Apps status board, to see if Google Docs, Drive, or Sheets are having trouble (which will often be reflected in DocsFlow error messages). Also please share with us ([email protected]msoftware.com) the problematic document using Google Docs sharing (read-only access is all we need). Note that we treat all your documents as highly confidential and will never share them outside the support team. For more details, see general support information.